A busy shopping centre, an amusement park or a hectic train station can all be part of your much loved family trips but they are also crowded places that make it easy for your little one to get distracted and lost. To make sure that your day out doesn’t end in a scary hide and seek game, Claire Barnder from Show & Tell Ltd. has developed a digital security wristband for children. The Me Finder allows you to store up to 5 phone numbers that can easily be saved and accessed by pressing just a couple of buttons. Before you leave the house, make sure that the monitor displays the number of the person that is with your child. You can then teach your child to “Show & Tell”: This simply means that they show their wristband to a safe adult and tell them to phone you while they wait for you to pick them up. The Me Finder comes in three funky and colourful designs and is super-lightweight. Its straps are made form very soft plastic so the Me Finder is comfortable to wear. Furthermore, there is a child-proof safety catch on the wristband to make sure that it doesn’t get lost while playing. 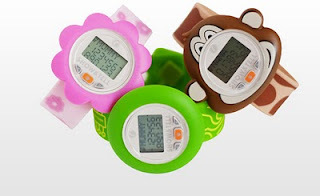 But that’s not the only thing Claire thought of when developing the Me Finder: The wirstband is also water-resistant so that it is ideal for the beach or pool and most importantly, your child can’t change the settings by playing with random buttons. Instead, they will be rewarded with some simple animations before the screen automatically defaults back to the phone number. Sounds too easy? Well, it gets better: If you don’t belong to the group of tech-savvy parents you can even get your numbers pre-programmed. Simple fill in a form when ordering the wristband online and it will come ready to use. The Me Finder costs £14.99, is available in pink, green and brown and can be ordered online from Show & Tell Ltd. I have a whopping ten Me Finders to give away to ten lucky readers. Please, do not forget to let me know how many entries you get using seperate comments. Congratulations – I will be in touch shortly! and now I'm a facebook liker too! Hi this is fantastic, esp as my daughter wanders off!! I have followed you via GFC, followed you on twitter as @meetjosmith and tweeted about you, liked on facebook as Jo Mse Black and on networked blogs as the same!! have subscribed to your email as well!! Have subscribed to your email!!! What an ingenious idea!! I now follow your blog! I also like you on facebook!!! I follow your blog and have tweeted. Would love this. Lovely competition! ThanksHave subscribed via email, tweeted you, liked on Facebook, and following on google friend and network blog. Following blog.Liked you on Facebooksubscribed Now leaving comment. I already follow you via networked blogs. Already doing no.1.Have done 2,3,4 and 6. Twitter @FlorrieFloyd.Thanks what a great prize. Following your blog as Maisie. Following on twitter as @maisietoo and have tweeted a link. I am following your blog and have tweeted as @AuroraDreaming thank you! Following via Google Friend Connect, already like on facebook. Hiya!Following on google friend connect! Hiya! following on Networked Blogs! Follow blog, like on facebook, follow on twitter, @tinkerbell34 tweeted, scribred to email.